A man from the Kyrgyz Republic was arrested Monday for defacing the Lincoln Memorial. WASHINGTON — A student from the Kyrgyz Republic was arrested Monday for causing what National Park officials called permanent damage to the Lincoln Memorial. 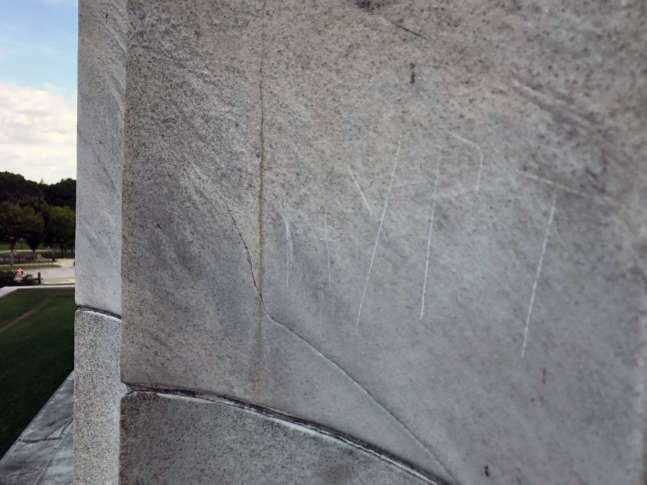 A U.S. Park Police officer spotted the man using a penny to carve the letters “HYPT MAEK” into one of the pillars on the north side of the memorial. Abraham Lincoln, the nation’s 16th president, is depicted on the U.S. penny. Nurtilek Bakirov, 21, was charged with felony destruction of property. He could face up to 10 years in prison plus a fine of $25,000. Bakirov made his first appearance D.C. Superior Court on Tuesday and was released on his on recognizance, a spokesman for the U.S. Attorney’s Office said. A judge has ordered Bakirov to stay away from the memorial. He is expected back in court for a hearing Nov. 1. “This does represent permanent damage to the historic fabric of the memorial. That is troubling and presents its own challenges,” said Justine Bello, architectural conservator for National Mall and Memorial Parks. Because the markings were etched into the stone pillar, that makes it more difficult to repair than surface damage from paint, Bello said. She described the damage as small — several inches across. In comparison, other graffiti left on the memorial this year was larger, she said. She said that Park Service conservationists would develop a repair plan in the coming weeks. She did not know how much the repair would cost. This is the third time this year that the iconic monument has been vandalized. Last month, vandals left offensive language on the memorial in red spray paint. And earlier this year, cryptic messages referencing former first lady Jackie Kennedy and President John F. Kennedy were scrawled on the memorial in black permanent marker. One of the most prominent landmarks along the National Mall, the Lincoln Memorial opened to the public in 1922. The Kyrgyz Republic is a mountainous country in Central Asia that’s home to about 6 million people and was once a part of the Soviet Union. WTOP’s Megan Cloherty contributed to this report.